OTTAWA, Ontario, May 17, 2013 -- The Canadian Museums Association (CMA) is encouraging all Canadians to visit and show support for their local museums and galleries in celebration of International Museum Day, Saturday, May 18. The goal of this annual event, held on May 18 every year, is to raise awareness about the importance and value museums bring to society. Institutions around the world can participate by offering free admission, special offers and unique events. Visit your community museums' websites to learn more about their involvement. 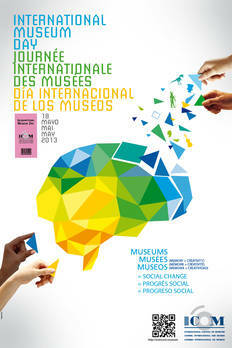 The first International Museum Day was organized by the International Council of Museums (ICOM) in 1977. The event has since provided museums with an opportunity to get creative and raise awareness about the challenges they face every day. This year, ICOM is aiming to inspire museums to make a difference in their communities by promoting the theme Museums (memory + creativity) = social change. "This year's theme is significant because it reminds us of our mandate to contribute to the future of Canadian society by remembering and honouring the past," says John McAvity, Executive Director of the CMA. "Museums have the power to promote creativity and innovation in their role as keepers of our national heritage. Canadians of all ages benefit from a visit to a museum and International Museum Day is an ideal time for it!" Canada's 2,600 museums attract more than 59 million visitors every year and nearly 15% of those visitors are students, our youth. Museums serve as ambassadors to our rich culture and attract more than half of all international tourists who visit our country. Museums make for a stronger local and national community. Serving as forums for public engagement and discussion, Canada's museums are more than repositories of preserved artefacts. Unfortunately Canadian museums continue to struggle to maintain their collections and keep our culture alive. The CMA urges the public to support their local museums in an effort to preserve our heritage for the sake of future generations. For more information on this year's celebrations, visit the International Council of Museums' website and follow the activity on Twitter using the hashtag #IMD2013.